The U.S. Department of Agriculture and its Farm Production and Conservation division are making major strides improving constituent services while saving millions of dollars through an IT modernization program, according to officials cited by a new report. The improvements are part of a broader investment shift to adopt a commercial platform-as-a-service (PaaS) that is allowing FPAC and its Farm Services Agency to consolidate seven digital platforms and 150 federal web resources into a single, mobile friendly website known as Farmers.gov. The digital platform behind Farmers.gov allows farmers, ranchers, foresters and agriculture producers to register their businesses electronically and gain personalized access to the services they need to manage their operations. 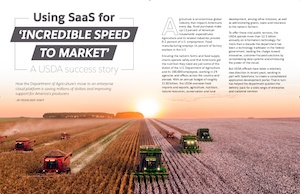 The story behind the USDA’s IT modernization moves are highlighted in a just-released report, “Using SaaS for ‘Incredible Speed to Market: A USDA Success Story.” The report was produced by FedScoop and underwritten by Salesforce. The adoption of commercial PaaS and SaaS technology stems from broader efforts at the USDA to establish a Digital Services Center to support all of the department’s agencies and offices. It also reflects USDA’s long-term decision to move away from maintaining on-site servers toward more modern cloud-based resources for application development. The USDA’s Digital Services Center offers assistance, guidance, support and strategic advisement for PaaS development. Working with experts from its cloud services provider, Salesforce, the center aims to remove obstacles to application development so agencies can deliver better experiences faster. USDA was also able to move toward a single shared services cloud environment by taking fuller advantage of Salesforce’s software-as-a-service for managing customer relationships. The SaaS platform enabled USDA IT teams to communicate and collaborate on projects and products, and avoid costly duplication of data management, programming and IT expenses. “One of the things we’ve gotten ourselves into a hole in is we tend to go after custom code as a solution,” said Sheridan. However, he explained that with the CRM platform, their offices were able to take advantage of configuring, rather than building custom code for applications. Read more about how the USDA’s adoption of cloud-based platforms is accelerating IT modernization and service improvement efforts across the agency. Find out about other trailblazers in government. This article was produced by FedScoop and sponsored by Salesforce.